As I was growing up, Pa Pandemic apparently had an aversion to the concept of a hotel and instead we filled the frequent KOA camper punch cards quickly as we toured and I was dragged around the country on “vacations”. During our sunny, hot, humid, cold, rainy, tornadic, and otherwise semi/non-hospitable vacations our shelter was a large green eight person army surplus tent or occasionally the car. Food was prepped with a series of stone cold reliable Coleman stoves. Our first Coleman was a 1940s era Dual Burner Coleman camp stove purchased used at a garage sale. 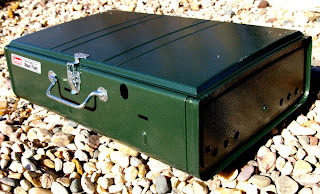 It looked like hell, but what I referred to as the suitcase stove, still lit every time... that is until it was accidentally and tragically run over after using it as a tire block on a steep grade. 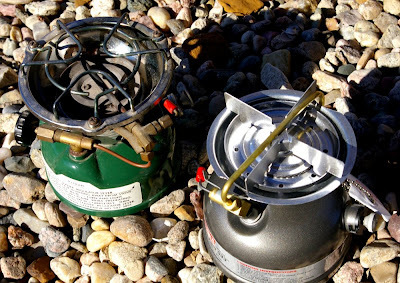 After that defeating blow to the large Coleman stove and a very brief interlude of over the fire cooking, Ma Pandemic took the opportunity to migrate us to restaurant eating and consequently we downsized from that great dual burner model to a new single burner Coleman 502 Sportster stove. From my perspective the new Coleman 502 Sportster seemed dedicated soley to making coffee in one of those old percolator pots with the glass lid handles, but did serve more than a few meals. The small 502 stove has easily run a hundred gallons of various fuel through it and still remains in use regularly by me today 30’ish years later. What impressed me most about those stoves back then were the durability. They were neglected, rained on, blown over experiencing three foot drops, thrown into the car (with force) more than a few times on hastened weather related retreats, and generally abused. They still always worked all without ever, from my memory, being cleaned. The old Coleman single burner has found a permanent home in my truck, used regularly for emergency feeding during long extended range days. 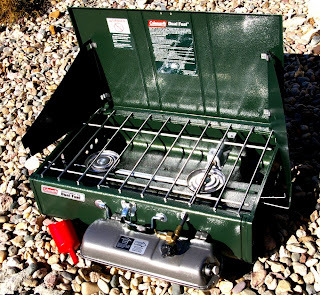 For camping though, I wanted a dual burner to assure pancakes, sausage and eggs could all be timed correctly to feed the starving camp troop with hot food and serve as the outdoor fish and chicken fryer to avoid getting the kitchen all nasty. The old Coleman Sportster was also so handy that I needed a second one around the house. The old version now located in my truck pulled duty heating everything from beans next to deck grill to melting lead for bullet casting. 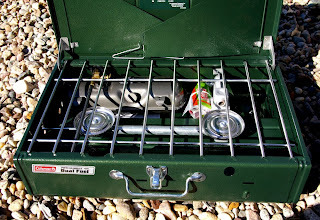 The Coleman Sportster and Powerhouse are one of the few stoves left which are made of good old fashioned steel. If you find a more study stove I would be shocked. For the record the old car flattened Powerhouse still worked, but was quite difficult to fold up. Both stoves definitely feel substantial due to the steel. That said they are not particularly the lightest camp stoves, but they will most likely be the only ones still working after 30 years of heirloom use. The paint finish on the new version is excellent and seems to resist abuse as well as or better than the old versions. These Colemans have become the handiest stoves for me during power outages, a few disaster situations, or simply a great way to cook food at camp, tailgating, or at the range. More importantly these stoves give you the peace of mind that no other stove can because they are Dual-Fuel. Although Coleman only recommends kerosene and unleaded, I have run the old dual burner and the 502 on everything from kerosene and unleaded, which provide the best results to diesel fuel and high proof alcohol. As the bullet proof design has not really changed at all, I see no reason why these new 2012 versions should not run all the combustible array of liquids the old versions did. That said the performance will always be best with kerosene. Other fuels including alcohol, diesel, and unleaded gas will provide a cooler flame and/or odor and/or soot. In general I have found that high proof alchohol and diesel provide marginally cooler flames that add about 1-2 minutes to boil times but do run longer. Unleaded has about the same heat output, but does produce an odor. If we are to compare the old vs the new versions the variances are small refinements which are focused on reducing weight were it makes sense. The old Coleman 502 Sportster is noticeably heavier than the new Sportster. Part of this weight is due to the change of a grate system to an integrated windscreen/grate which reduces a lot of weight and still provides complete support of various sized cups and pans. The gas valves are also different where the old 502 has both a shut off and knob regulator (which personally seemed redundant to me), the new version combines the functionality into the single shut off style valve all while saving more weight and keeping costs to a minimum. The new Powerhouse is more reliable and holds pressure longer than what I remember the old pre-crushed stove offering. Operationally though, everything seems about the same with the ability to fire up just the right primary 9000 BTU or both the primary and secondary 8000 BTU left burner which is activated by a butterfly valve on the left outer side of the stove. In the old model the left burner provided about 50% the output, on the new version it seems the outputs are very similar. Like the older model, the Coleman Powerhouse has integrated wind shields to help not only keep the flame unaffected, but also helps with pan and cookware efficiency. 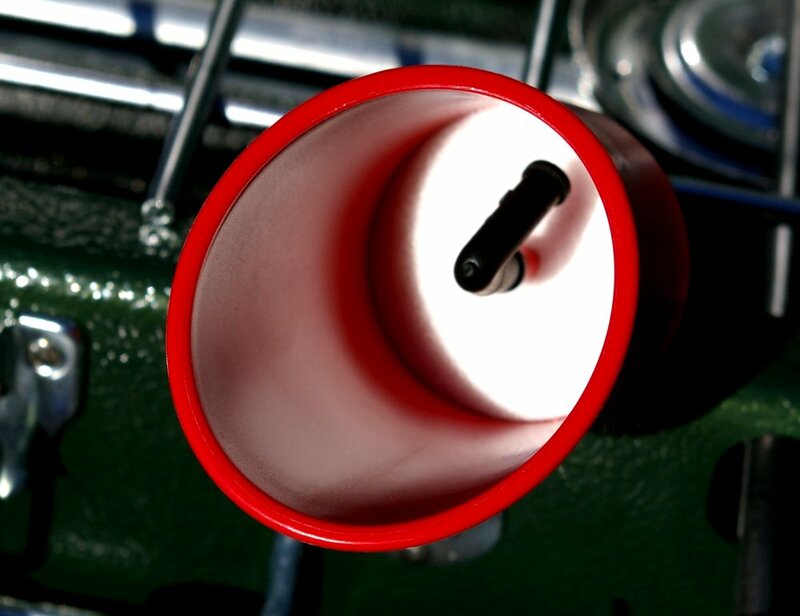 A simple thing that makes a huge performance and operational difference is the inlcuded filler funnel with integrated filter. No matter how careful you think you are with the fuel, you will be surprised by the garbage a simple filter catches which would interfere with the performance or operation of the stoves. 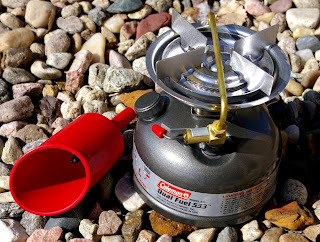 Coleman does not recommend storing fuel in the stoves, however I have always done so and never experienced any leaks after de-pressurizing the tank before storage, but this is your choice. 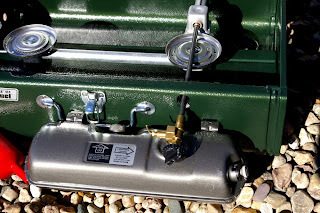 Generally I keep my Sportster full and ready to go and fill the large dual burner Powerhouse as needed. 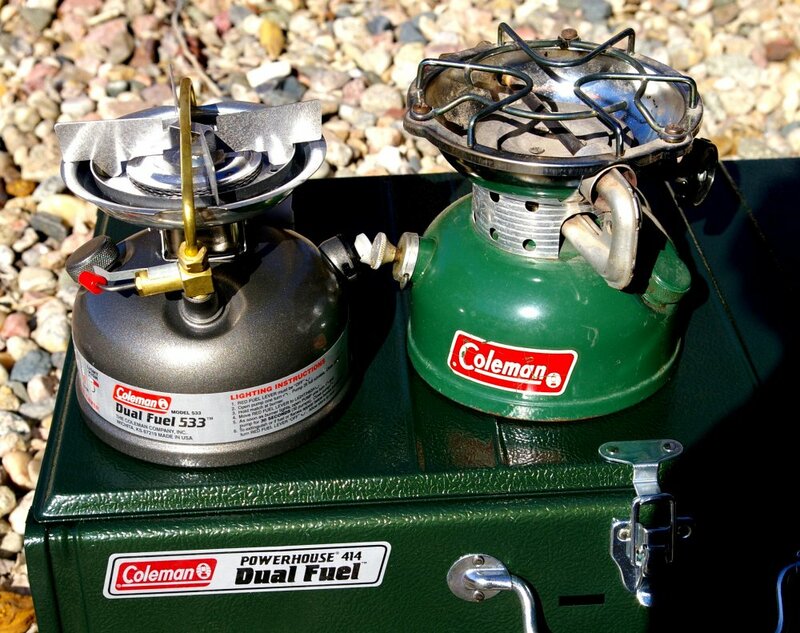 The Coleman Powerhouse will run for 2.3 hours on high with both burners operating without refill and the Sportster will run 2 hours on high. From an output spec perspective the Sportster delivers 10,500 BTU which a bit more than the 9,0000 BTU output one burner can do on the dual burner Powerhouse. With the larger tank, the Powerhouse will run considerably longer on a single burner without refueling. The Sportster is always ready to go and requires no setup. 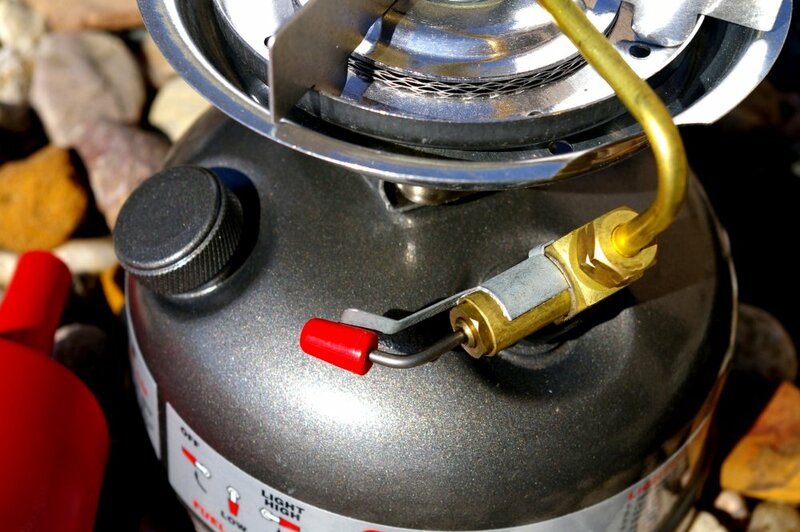 Pull it out, place it on a stable surface, use the integrated pump and pump about 40 times, hold your lit Zippo next to the burner and flip the red gas knob to light, and then adjust as needed as the system heats and pressurizes. In theory the regenerator tube over the burner heats and repressurizes the tank, however my experience is that if you are running for extended periods or low on fuel, you may need to give the stove a pump here and there. The Powerhouse operationally is the same, but there is some nominal setup required as the tank is stored inside the stove when not in use. 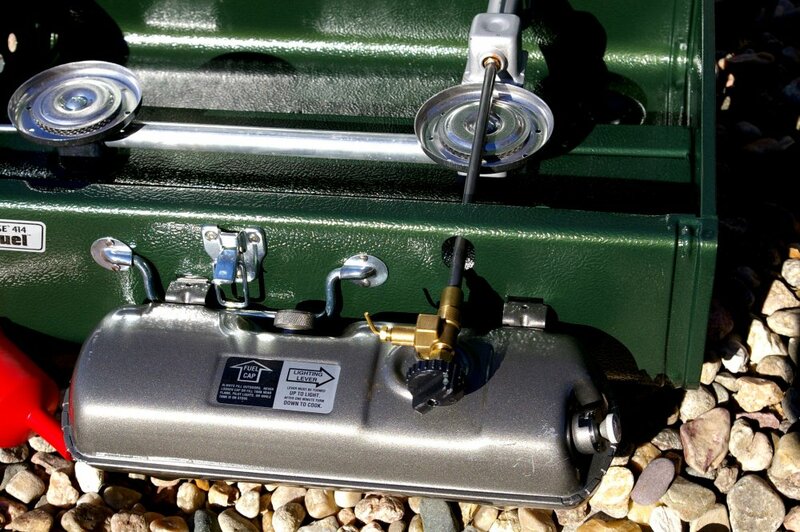 Set the Coleman Powerhouse on a stable surface, flip open the clasps and open the lid and crate to remove the tank assembly. The tank assembly mounts on the front of the stove with the fuel tube running inside over the right primary 9000 BTU burner. 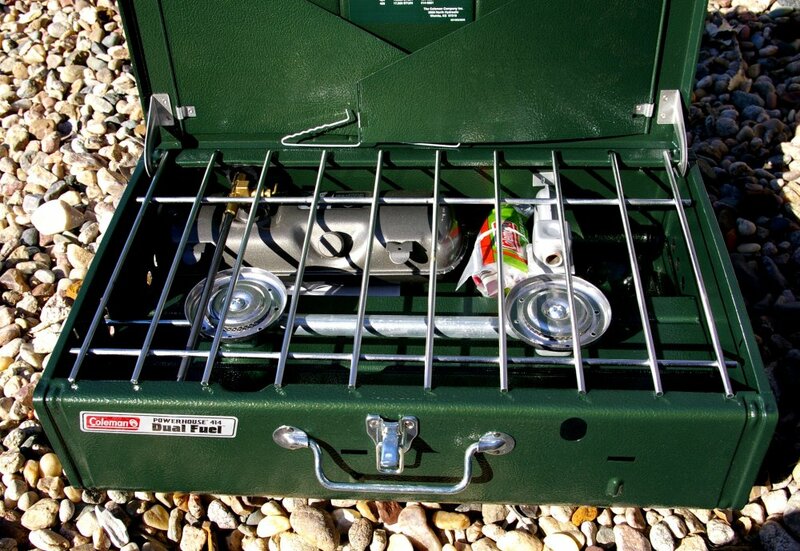 The suitcase sized Coleman Powerhouse may seem like a lot of wasted space, however extra points go to those that realize those hollow cavities in the powerhouse can be filled with food and utensils once the stove is cool. I validated Coleman’s Sportster 4 minute 1 Qt water boil and the Powerhouse did it just under 5 minutes. Most importantly I cooked several filling meals on the stoves and they both worked as advertised. Happily Coleman has not surcomed to the idiocracy of putting 50 safeties on everything to protect the morans. Both stoves can be used easily and safely by any mildly intelligent individual, though the idiots will still find away to burn themselves. I am not big on products focused solely on survival or only preparedness. These multi-fuel Coleman stoves are smart common sense products which provide multi-use convenience, outdoor cooking and happen to be one of the best stoves for preparedness functions. The key feature of these stoves is their multi-fuel capability. Sure performance or flame odor may be impacted with anything less than high quality kerosene, however with other fuels the stoves will still work and provides a fuel flexibility many stoves cannot duplicate. To achieve this flexibility some performance efficiency is given up, however that minor performance reduction does not outweigh the durability and fuel flexibility of the Coleman Powerhouse and Sportster stoves. At least Coleman is still assembling these stoves in the US with US & foreign parts. It may be a small item to some, but I feel it is a big deal that labor and some manufacturing is still in the US where it should be. Whether the need is to cook up a couple pots of chili for your team or deliver cooking capability during a grid or power out situation, these Coleman stoves are must have items for every home in the US.